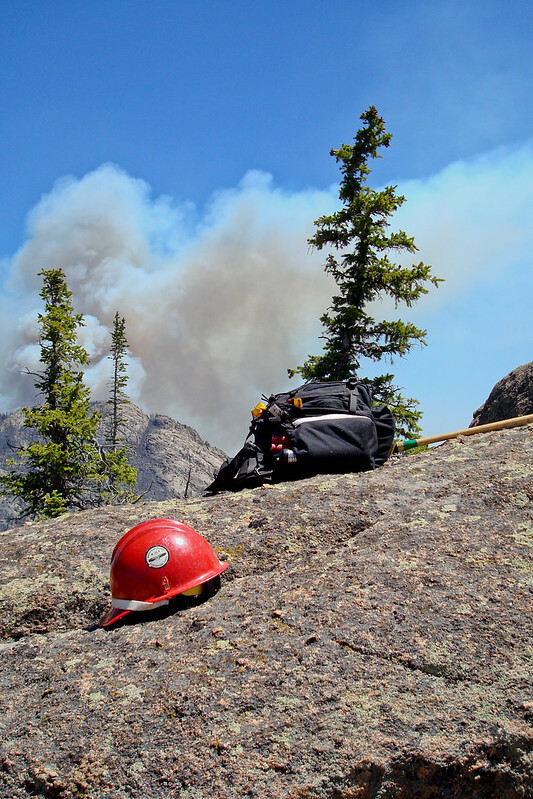 Above: Fire in the mountains of central Wyoming, 2012. As I was driving home from work the other day, mentally running through the events of the week, it dawned on me that over the course of my fire career I’ve had to acquire skills in a number of areas that I never really imagined I would. Of course I’ve picked up the obvious skills – running a chainsaw in the brush and falling hazard trees, driving on winding mountain roads, using and maintaining hand tools, navigating through wild country, camping in the wilderness, those sorts of things. But I’ve also had to get good at other things – contract administration, purchasing and business practices, radio programming, integrating new technology into old ways of doing business, and computer and IT tasks. I’ve become an amateur weather forecaster, landscaper, travel agent, fence-mender, and unskilled carpenter and metalworker, all while being a “wildland firefighter.” As I ventured into aviation, I’ve had to learn how to be a risk manager, safety officer, and teacher, as well as a cargo-handling specialist and somewhat grumpy flight attendant. I really have become a “Jack of all trades” while wandering along the path in life I’ve chosen. I’ve had to draw upon a huge variety of sources to gain that knowledge – some I learned from mentors on the job, some I picked up through experience, gradually figuring out the best ways to go about a task, and some I was formally trained how to do. I’ve brought skills and knowledge from my personal life to play at work, and I’ve used working skills in my personal time. The longer I thought about it, the more obvious it became that this same “Jack of all trades” idea also applies to fire leadership. There is no single skill that makes a successful leader or follower, just as there’s no single skill that makes a successful firefighter. In order to be a good leader, we need to draw upon knowledge and skills gleaned from a variety of places, not just one or two operational areas. I’ve personally found that leadership skills can be found just about anywhere – music (think of jazz improvisation, and how leaders and followers work together in a dynamic environment), business, sociology, the military, religious groups – the list really is wide open. I know that in my leadership journey I’ve become more aware of things like risk management, behavioral economics, resilience, and the physiology/psychology that drives decision-making. I’ve had to study strange topics and approach new ideas that are miles away from the fire behavior and suppression topics typically found in fire classes. While things like behavioral economics appear unrelated to the 10 & 18, LCES, and fire behavior calculations, they do come in pretty handy when trying to figure out what we as people will do when faced with situations where the 10 & 18 and LCES are important. And let’s not forget, the “C” in LCES happens to involve quite a bit of human behavior if you stop and think about it. I know being aware of how and why others make decisions and communicate – or don’t – has been helpful to me in the field. As happened in other aspects of my life, I’ve found that I’ve had to expand my knowledge and skill sets way beyond what I ever envisioned needing. I guess the take-home message to be found here is pretty simple, really: Never stop exploring, learning, and growing. In order to be the best firefighter, leader, and person that you can be, you really do need to be a Jack of all trades. Learn all that you can, and apply it in ways you might not have thought about before. I bet you’ll be surprised by what happens – I know I have been.